The finished shawl is about 5.5 feet at its widest point and 2 feet deep in the center, which is slightly bigger than the dimensions given in the book. 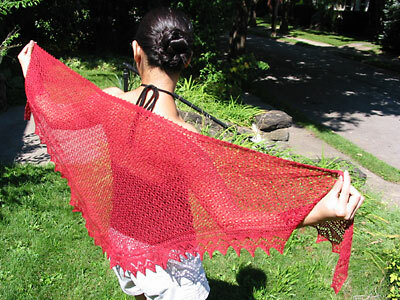 The construction of the shawl is pretty simple. You cast on 49 stitches, increase steadily until you have 301 stitches, and then do a picot bind-off. Then you attach the edging. The shawl isn’t so much curvy as trapezoidal. This is a true knitted lace pattern, with patterning on every row. Both the main body of the shawl and the edging are garter-stitch based. My other lace projects have been stockinette-based with patterning only on right-side rows and I found this to be a step more difficult. This is one of those projects that requires too much attention to knit while watching TV, but is much too mind-numbing to just sit and knit. In other words, it’s perfect podcast-listening knitting. I really enjoyed knitting with the Zephyr. It feels nice, doesn’t break easily, and looks lovely in the finished project. I found it to be a tad splitty, but I am the Queen of Yarn Splitting, so take that with a grain of salt. The yarn bled quite a bit as I was blocking the shawl, not as badly as Grumperina’s Fir Cone scarf, but badly enough to require a dozen rinses to make the water run sort-of clear. Regular Addi Turbos are much TOO BLUNT for this project. Working a k3tog with these needles is like trying to perform surgery with a pickax. Now I just need a dress to match. 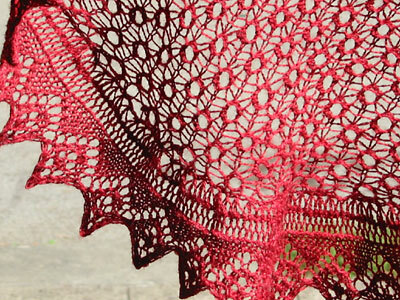 CogKnition posted this on September 3rd, 2007 @ 5:04pm in Finished Objects, Lace, Scarves & Wraps | Permalink to "Curved Shawl with Diamond Edging"
Oh, that is absolutely beautiful. And did you really do this project entirely on normal Addi Turbos? That sounds almost masochistic. I think I’d rather poke my eyes out first. It looks ashtonishing !! How much did you spend Zephyr ? I bought that yarn for Mystery Stole but now I donÂ´t wont to do it and IÂ´m looking for another nice scarf or stole pattern. I have a big cone of Zephyr and I’m not sure how much of it I used. The pattern calls for 750 yards. Since my shawl came out a little bit bigger than the pattern, I’d say 1000 yards is a safe guess. It would be pretty easy to make the shawl smaller if you started running out of yarn. Just knit fewer vertical repeats. For every vertical repeat you delete, knit one less edging repeat. Congratulations! It’s very beautiful!! I too had a lot of trouble with the first two rows, but I eventually let it be and just knit on (have only about six inches now). Yours is an inspiration to finish….